Located on the turquoise coast of the Mediterranean sea, Valencia is the third largest city in Spain, appreciated for its city beaches, relaxed, holiday-like atmosphere and its fantastic infrastructure. 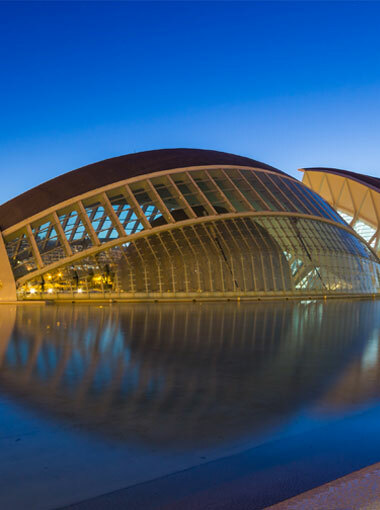 It is the home of one of the most interesting modern districts, known for the signature architecture of Santiago Calatrava. This complex City of Arts and Science is a true architectural gem, called by the locals “the district of the future”. It amazes the viewer with a series of stunning buildings, right next to the magnificent 12km long Turia River Bed Gardens. You will love the authentic food – Valencia is worldwide famous for its chicken and rabbit paella, which tastes like no other. Valencia has also a suberb hotel base and all what you may need to host a successful business meeting or a workshop.